Visiting The Wave is like winning the lottery. But seriously, you have to win the lottery to have a chance to visit this jaw dropping, peaceful, other worldly place. Is it hard to get a spot? Yes. Is it completely worth every effort in an attempt to get a spot? A million times yes. 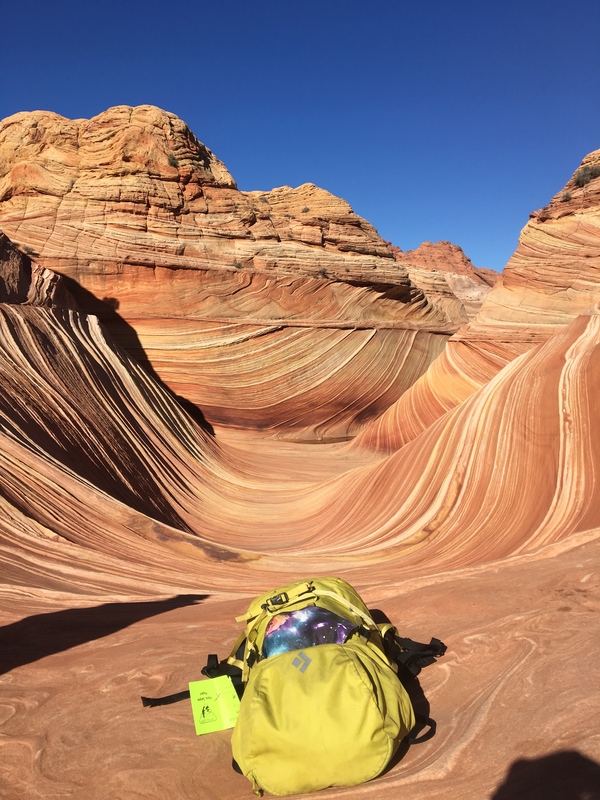 For those of you who are perhaps hearing about The Wave for the first time while reading this, The Wave is a very unique, sandstone rock formation located in Arizona, just over the border from Utah. 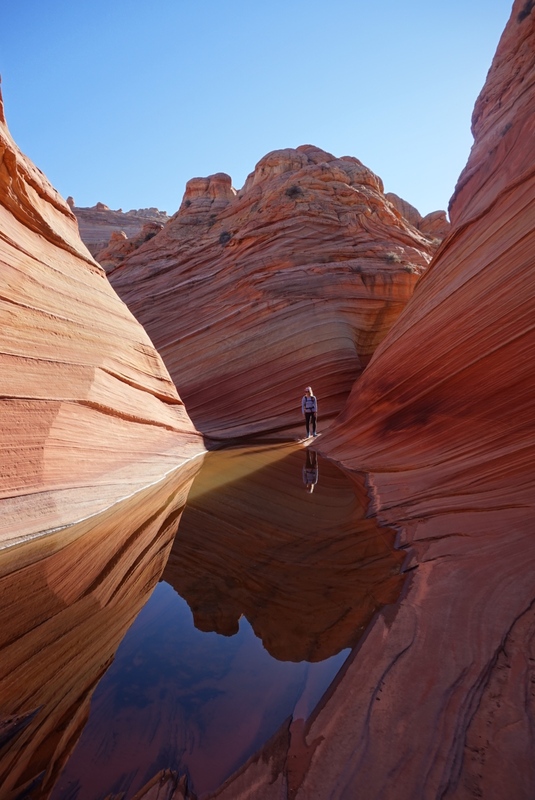 It is located in an area called North Coyote Buttes, in the Paria Canyon-Vermillion Cliffs Wilderness. It requires a three mile hike in to access it, with no official trail. 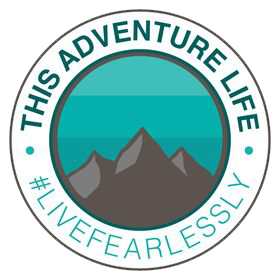 The round trip hike is six miles (ten km), plus whatever hiking you do once you are at The Wave! 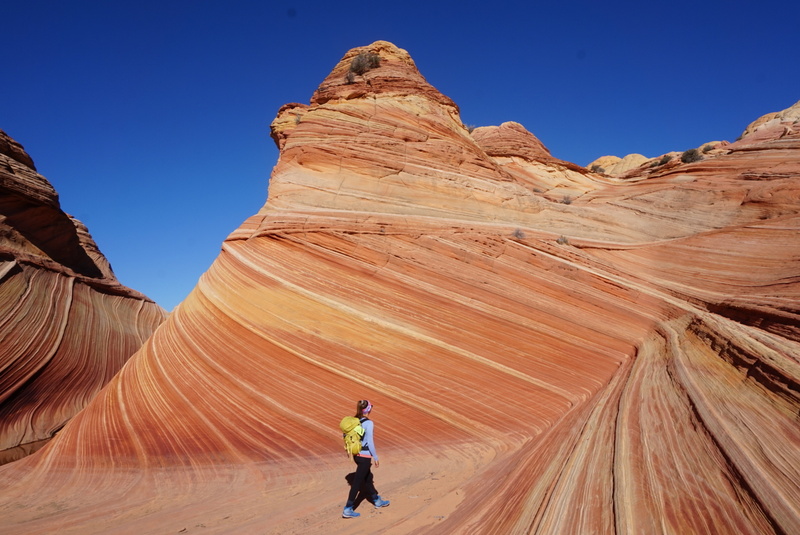 There are twenty people allowed in North Coyote Buttes (The Wave) each day. Not twenty permits, twenty people. There are two options for getting a permit. The other option is to obtain a permit in person, the day before you wish to go to The Wave. This is what myself and my partner did, and fortunately we were one of the lucky ones whose number was called. For example, if you wish to get a permit for a Friday, you would show up for the lottery on Thursday morning. The in-person lottery is held in Kanab Utah at 745 E. Highway 89. The lottery is held at 9:00am Mountain-Standard Time. You show up at 8:30 to receive information, fill out your form, and wait. From mid-March to mid-November, the lottery is held seven days a week. From mid-November to mid-March, the lottery is held Monday-Friday. This means that on Fridays during that time period, they will draw for spots for Saturday-Monday. Once you arrive at the lottery, they give you a run-down on the process and how it all works. After that, you fill out and submit one application per group. A group may contain up to 6 people. If you submit different applications for each member of the group to increase your odds, you will be disqualified. From there, your application will be given a number. Once everyone has a number, the lottery begins! 10 spots are given out. For example, if the first number called is a group of 6, than only 4 spots remain. If there ends up being 9 spots filled however, and the last number drawn is a group of 2, they will allow 11 people to go so as not to split up the group for safety reasons. 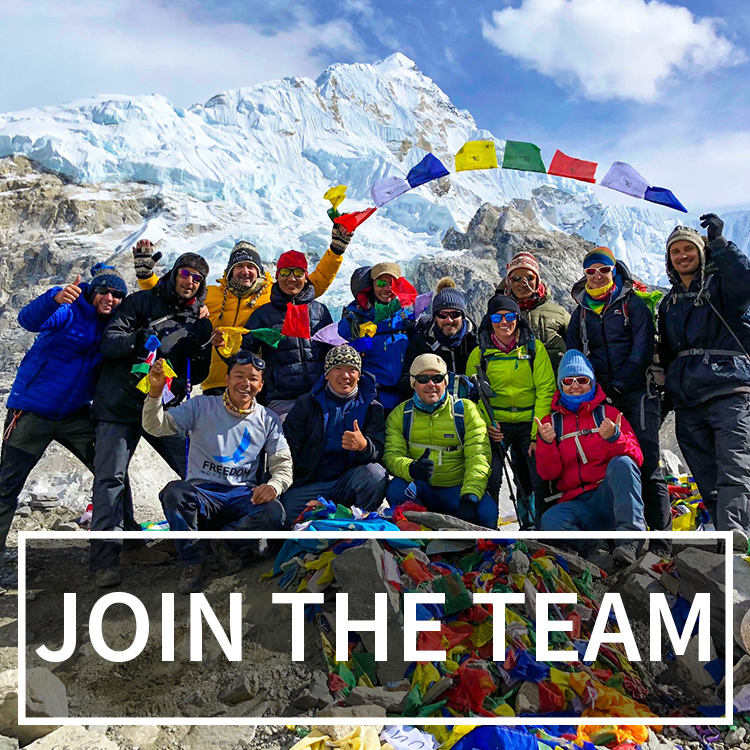 In the end, if you are awarded a permit, it is $7US per person. It is payable by cash or check, so I recommend having that cash on you when you attend the lottery. They will then keep you for roughly 30 minutes after the lottery to go over safety notes, maps, how to get there, rules, etc. 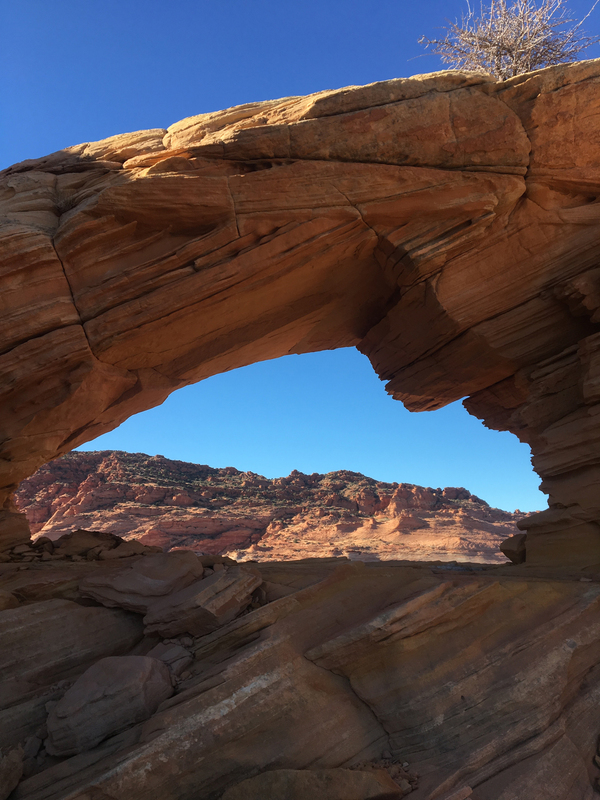 We headed to Kanab for a few days so we would have multiple chances to enter the lottery. 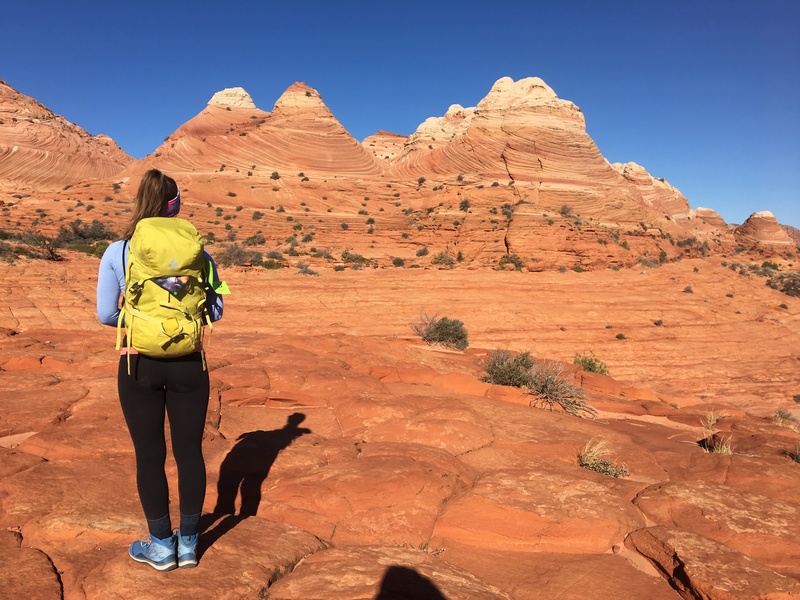 Kanab is a small town, however, there is a lot to do around the area. We figured if we didn’t win the lottery than at least there were lots of things to fill our time with while we kept trying for a chance. We arrived on a Wednesday night and decided to splurge on an RV park so that we would have a chance to shower and get WiFi. We stayed at J&J RV Park. The facility was very clean, the owners incredibly kind and generous, and the showers were hot. All in all I recommend this place highly. On Thursday morning, we headed to the spot to try our hand at the lottery. They only let one person from your group in the lottery room, so I went the first day seeing as I was the one who organized/knew about the process for The Wave. Much to my disappointment, we unfortunately did not get a spot. To fill the day, we headed to do a hike called Wire Pass. 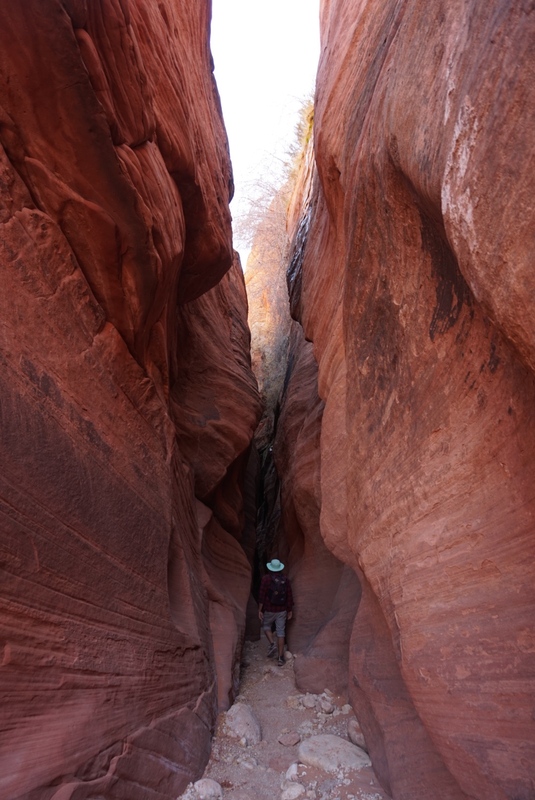 It’s a great option for an afternoon hike and it takes you through a tight, beautiful, slot canyon. The Wire Pass trailhead is the same trailhead for The Wave, so it was good to know where that was anyways and make sure our van was able to get down the road, which it did without any issues. If it had recently rained, this road could become gnarly fast, so make sure to check on conditions before you set out should you get to go to The Wave. 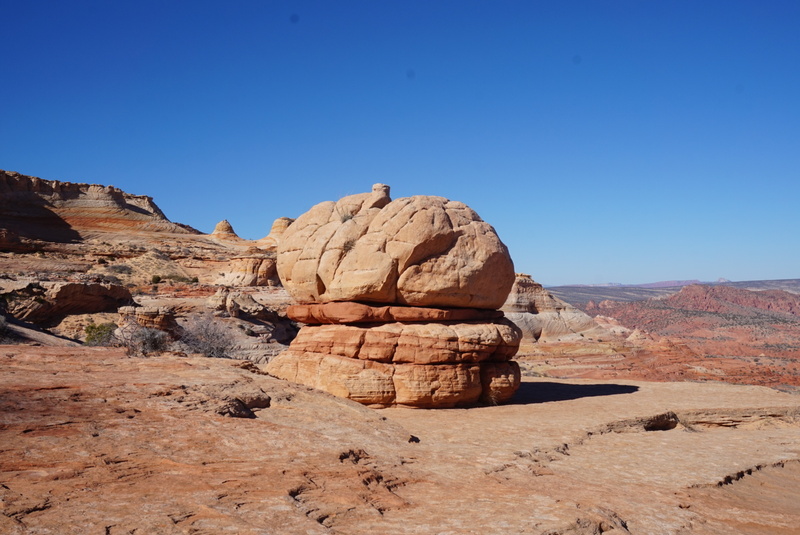 We also drove nearby to check out a rock formation called “The Toadstools.” They are not a far hike, but a very cool sight to see. On Friday, we headed out early to try our hand at the lottery again. I asked my partner to go in the room this time, just in case he was better luck than myself. Silly, I know, but it couldn’t hurt to give it a shot. Seeing as it was a Friday and late in the season, they were drawing spots for Saturday-Monday. I was hoping we might have better odds, but in turn more people showed up. I think the total number of people was something like 147. I waited patiently for him to get out of the room, and sure enough he came out with a big smile on his face because he got a spot for Sunday! If I said I was excited, that would be an understatement. I was ecstatic! So we stuck around, got all the information we needed, purchased our permits, than left to make plans of what to do until Sunday. 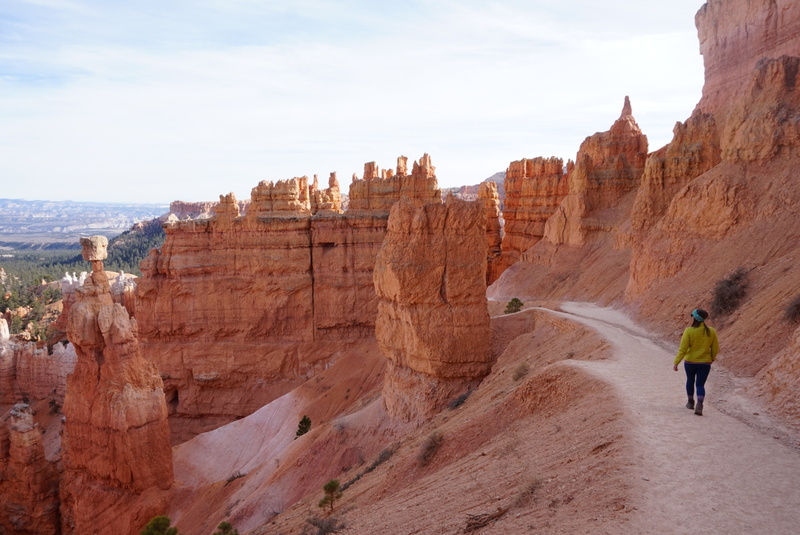 To pass the time, we decided to check out Bryce Canyon (an hours drive) and Pink Coral Sand Dunes State Park to try sand boarding. If you find yourself with time to kill in the area, these are both incredible things to do! 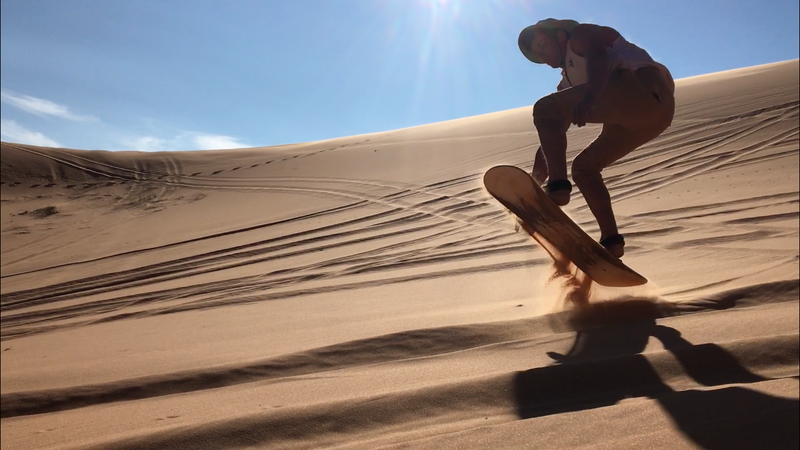 Bryce was incredible, and the sand boarding was hilarious and fun. Finally Sunday rolled around and we were headed to The Wave! We started the hike at the Wire Pass trailhead, but soon left the trail to head towards our first landmark. The map they give you is broken down into sections by landmarks. They talk about people getting lost often, but we found it quite easy to navigate and didn’t experience any challenges. It is a 3-mile hike in, which took us just over an hour. Before we knew it, we were walking into the wave. Embrace this moment and soak it in because it really is something else. Step with grace, as the rock is incredibly fragile (hence them limiting the amount of people allowed in each day). Sometimes you see a place so many times in photos that it doesn’t live up to your expectations when you see it with your own eyes; this was not the case. We sat at the top of The Wave in awe for probably an hour. We took photos, breathed it all in, met some new friends, than headed out. If there is one point I’d like to stress it’s this: Don’t just see The Wave and leave. Sounds simple enough, however, so many people do this and to me you have now wasted the opportunity to visit the area that you were given. 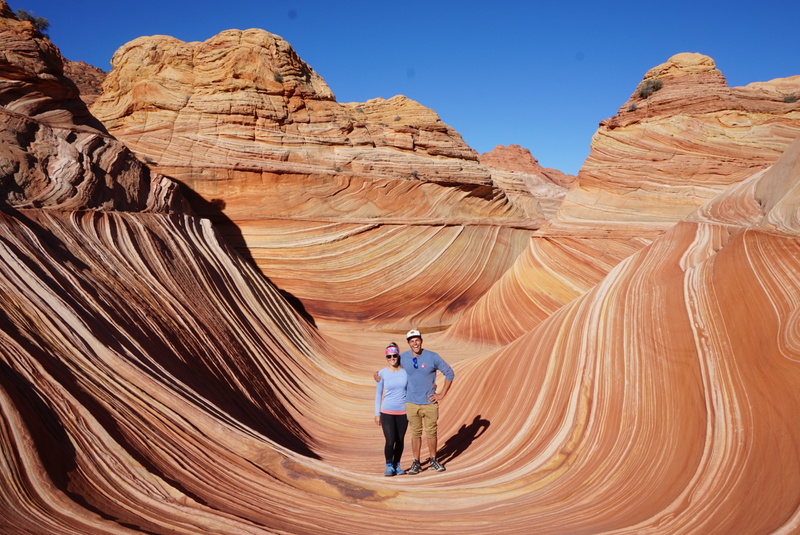 The Wave is breathtaking and incredible, however, the North Coyote Buttes area has so much more to offer. The landscape is unreal, and there is so much area to explore there. Take advantage that you have the permit for the day and see as much as you can. We ran into a ranger who checked our permit and suggested a cool sight for us to see. Boy was she right! Ladies and gentleman… may I present to you the giant hamburger! 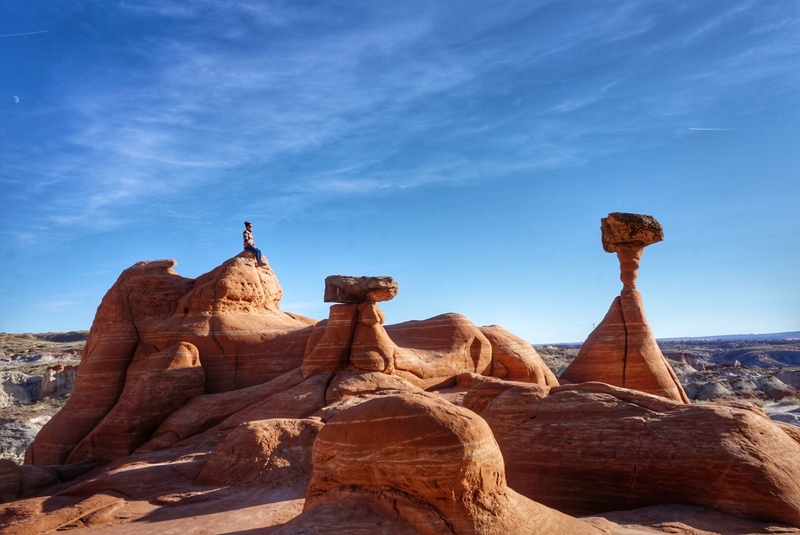 This completely natural rock feature blew our minds. How it came to be, I am not sure, but it was definitely the cherry on top of an already amazing day. 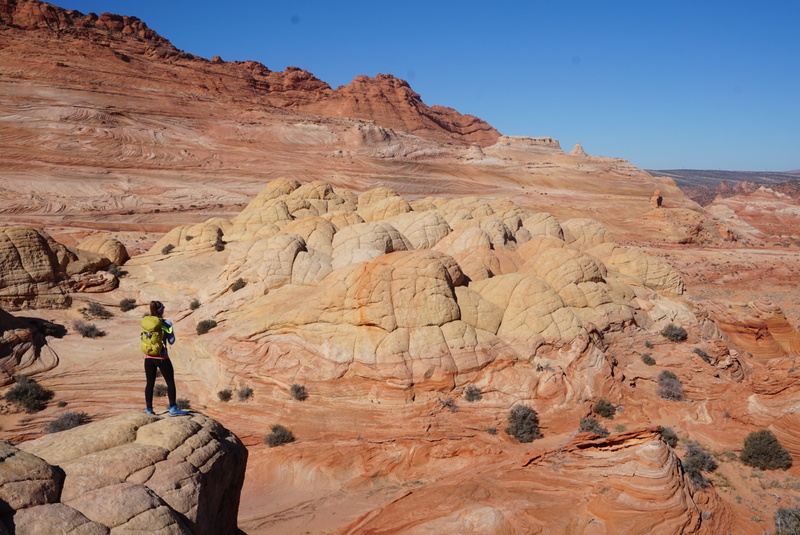 From there, we went and found a little oasis, some arches in the rocks, and a gorgeous dune feature. All in all, we left the car at 9am and returned by 4. It was a solid day exploring lots of terrain. We estimated we probably hiked around 10 miles. We had a perfect weather day, so we soaked in as much of it as we could. At this time of year, the days were short, so we tried to max our daylight while also allowing time to drive. 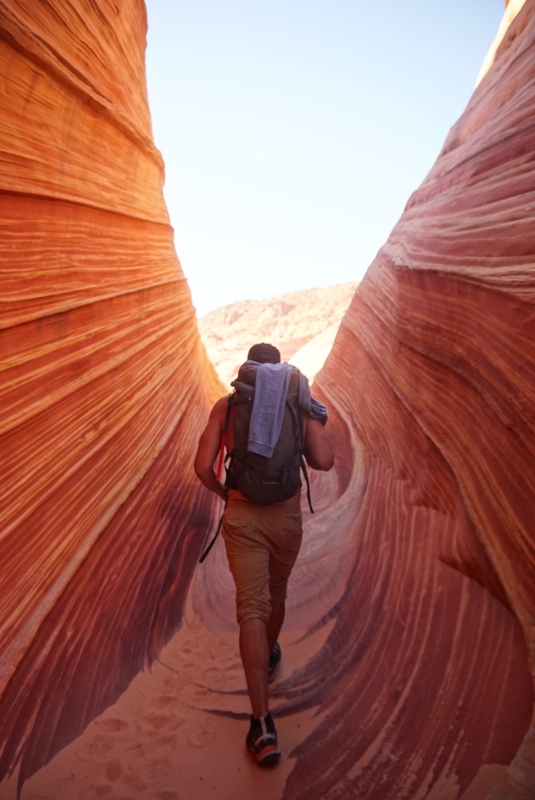 Like I said before, if you get the very fortunate opportunity to visit The Wave and the North Coyote Buttes area, you want to make the day of it and do as much as possible. This means you need to be prepared. SPOT, InReach, etc. – There is no service out in this area, so make sure you have a way to get in touch in case of an emergency. Water (minimum 3-4 litres) – The desert is dry, even in the winter. It may not be hot (especially when we went. It was only 9 degrees), but the dryness means you need to keep hydrated regardless of the temperature in the air. Food – This is probably a given, but make sure you have lots of food and snacks for your day out. It can be a long day, especially if you go during the summer, so be prepared to keep yourself fueled. WagBag – A WagBag is essentially a poop bag for humans. It may sound gross, but if you need to do your business out there, please bring one of these bags to pack it out. The desert does not have the enzymes to break down waste, so should you go and leave it out there, it will not go away! Keep the area clean and pack out what you pack in, including your personal waste, garbage, anything. Permits – Make sure you have your permit on you and displayed on your backpack as well as one on the dash of your car. They check these very frequently to avoid people going in without one. 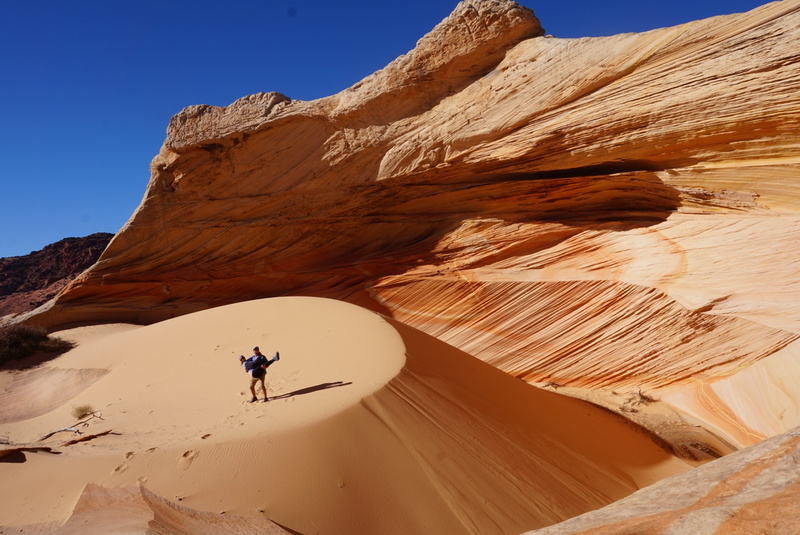 North Coyote Buttes is a truly remarkable and special area. 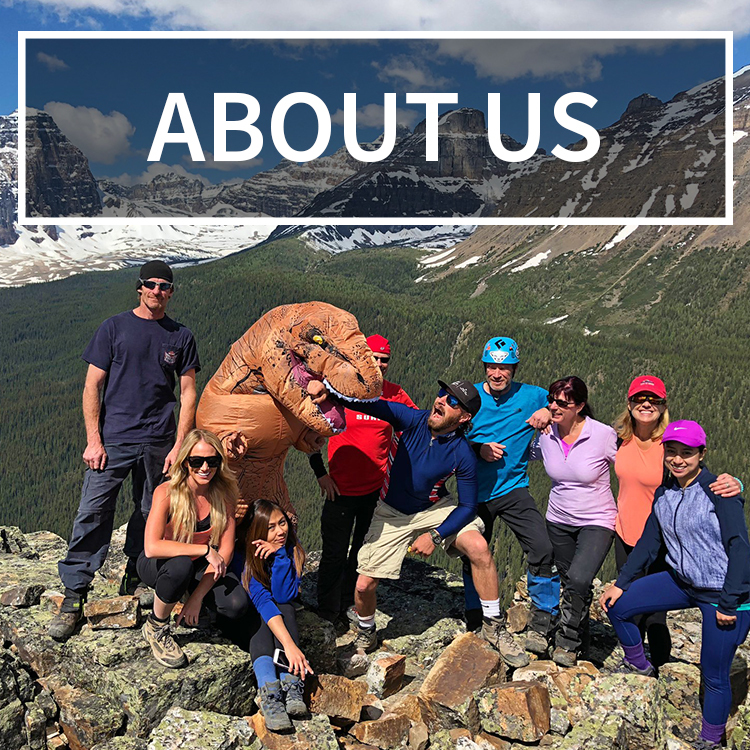 With so many incredible geological features to experience, make the most of it and explore as much as possible. Should you get a permit, you really are one of the lucky ones! So to that, I say make sure you act like it. Treat the area with respect. Treat it with love. Its delicate, fragile, and needs to be preserved so that people can continue to experience its beauty. The Wave is a magical place that few are lucky enough to experience, so lets make sure we leave it the way we found it, and educate others to do the same. An amazing experience you guys had, thanks for sharing!!! And well done on the vlog post, great content!!! This definitely, as you mentioned, is like winning the lottery (bucket list adventure, hands down). Hopefully I’ll be able to experience it in the near future. And appreciate the extra suggestions, will have this in the memory bank!! !